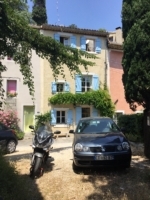 Property for sale in Carpentras, France. Properties Carpentras. The village lies between Mont Ventoux, the lavender fields of Sault and the walled city of Avignon - a perfect combination of culture and countryside! A wonderful area for exploring which is why it's a great place to live and why visitors come back again and again for a settled pace of life. There are local markets every day, a farm shop nearby, walking and hiking and biking trails through hugely varied scenery and countless villages, towns, restaurants and wines to sample. For everyday living the village has shops including a bakery, hardware store, general stores, tobacconist/newsagent, hairdressers, 2 bars, 3 restaurants, wine caves, doctor, nurse and a primary school. There's also a municipal swimming pool open during the summer and a lake 5 kms away. The nearest pharmacy is also 5kms. Only 15 kms to nearest large town of Carpentras for main shopping, hospitals, secondary schools. It's 40 minutes to Avignon and the TGV station. Airports are at Marseille, Nimes, Montpellier, Nice, and summer flights to/from Avignon.